Topics: Why Renewables, In The States, On The Hill, Endorsements, Projects, and Newsroom. 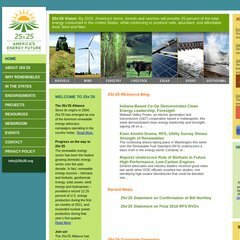 25x25.org 25x&apos;25 - Bold New U.S. Energy Goal Adopted by Senate: 25 Percent .. The site has about 63 users daily, viewing on average 2.70 pages each. Its 2 nameservers are dns2.easydns.net, and dns1.easydns.com. 25x25.org's server IP number is 206.123.92.198. It is hosted by Rochen Limited (Texas, Dallas,) using Apache web server. PING (206.123.92.198) 56(84) bytes of data.